Perry Block - Nouveau Old, Formerly Cute: Blame the Mucus! Now who the hell is that guy? I've been fascinated of late by a series of commercials where a man suddenly and unexpectedly appears in an attractive young woman's bedroom sitting right next to her in bed. That's a talent many of us would like to have. This fellow, however, is bit different. 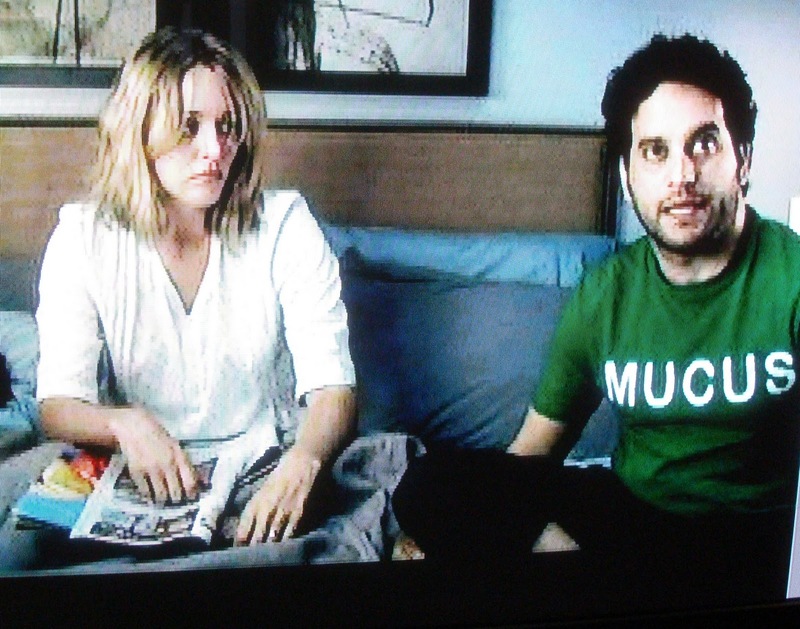 He's wearing a t-shirt with the word "MUCUS" written on it, and the reason he's materialized is to beat the rap that he's responsible for the woman's nasal congestion. Go Ahead, Blame the MUCUS!" he says to her cynically. After explaining that Advil's the answer to the real problem, swollen membranes or something like that, you'd think the guy would make his move. Sure, in one commercial there's a husband present and in the other a young daughter, but the husband's fast asleep and the daughter just about ready for bed. 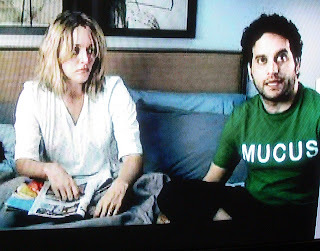 But apparently this Mucus guy has even less cool than you and me! Well, I'm proud to tell you that I --- Perry Block --- have been cast in a new television commercial that follows along the same lines as the one for Advil. And hopefully I'm going to handle things a whole lot slicker than Mr. Mucus! Very attractive young woman is sitting up alone in bed in scanty negligee looking very nauseous. "Oh, I feel so sick! It must have been all that lasagna. Washed down with the bottle of chianti. Followed up by the linguine, the keg of beer, and the Moo Goo Gai Pan, then the Cherry Fudge Ripple ...."
Suddenly in bed right next to the woman as if by magic, I appear. "Go Ahead, Blame the VOMIT!" "Sure. See, it's written right here on my T-shirt and ... "
"No, I was just startled. Of course, you're the VOMIT! It's perfect casting!" "But I'm so sick!!! You mean, it's not the ...."
"It's not the VOMIT. You're sick to your stomach because you've been watching the American political process on television." " I have, that's true." "All those inane candidates! Taking positions they don't believe in, making promises they can't keep. Everything driven by money and ego, not leadership!" "But then what do I do, VOMIT?" "I recommend new improved Off Switch! Just flick it. Then read a book, go to a museum, or see a concert (Not ABBA though!) Do something constructive." "So I can breathe .... easy! And not puke! Why, thank you, VOMIT!" "You're welcome. And now that's out of the way, doll, what's say you and I ...."
"OMG! NOW I'M REALLY GONNA BE SICK!!!" You've brought self-deprecation into the realm of fine art with this one. The Vomit might be visiting you next! Now I know why I've been feeling so queasy lately. It's not the flu, it's the debates. Thanks! Yep, that's the reason. If there's a third guy with a "Flu" T-shirt, don't blame him!